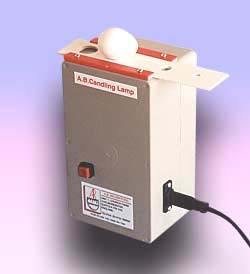 This latest candling lamp from A.B. Incubators incorporates features especially designed for the dedicated breeder of rare and endangered species as well of those more at home with domestic varieties. The development of this lamp has taken place over the past ten years and we believe it to be the most versatile lamp available today. It may be used in either the upright position with the egg above the light source or with the light exiting the box horizontally and the egg held against the slide, allowing a more complete view of the embryos features. This versatility is only made possible by the use of a diachronic lamp which actively draws the heat away from the egg whilst the multi mirrors reflect the light along a focused 13 degree beam, giving higher than normal intensity. The slide should be moved to select the correct diameter of hole that best fits the egg being candled. We have tested this lamp on eggs from lovebird to ostrich with great success, however certain eggs have shells so dense that no light can permeate them at all, these should be monitored using weight loss techniques.